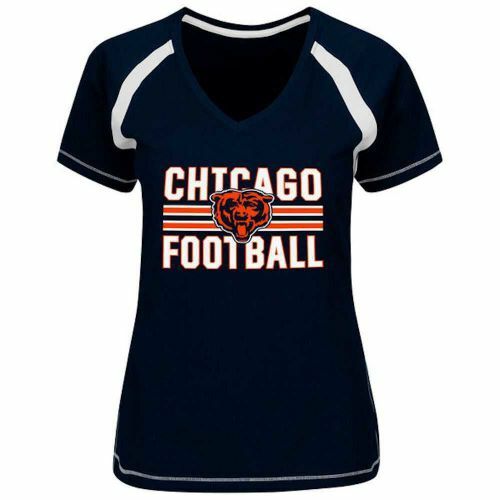 Chicago Bears women's plus navy Her Day v-neck tee by Majestic has white insets on the sleeves, white accent stitching and features Chicago Football along with stripes and the Bears retro logo in jersey look screen printing on the front. Available in women's plus sizes L, and 1X. 100% cotton (HERDAYV-BEA) Majestic Women's Plus is generously sized for full figure women. Service Area: Shawano, Appleton, Green Bay, De Pere, Kaukauna, Waupaca, Schofield, Antigo, Clintonville, Little Chute, Hortonville and surrounding communities.